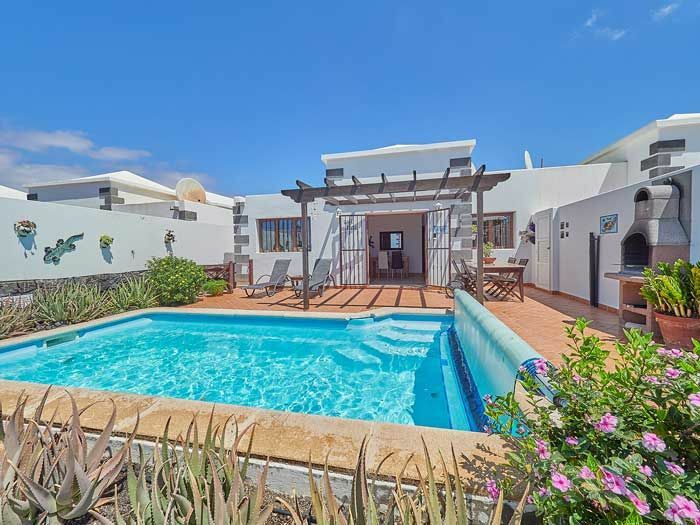 Casa Arabella is a great secure base for a holiday in Lanzarote whether you are a couple or a family seeking a perfectly sized villa. 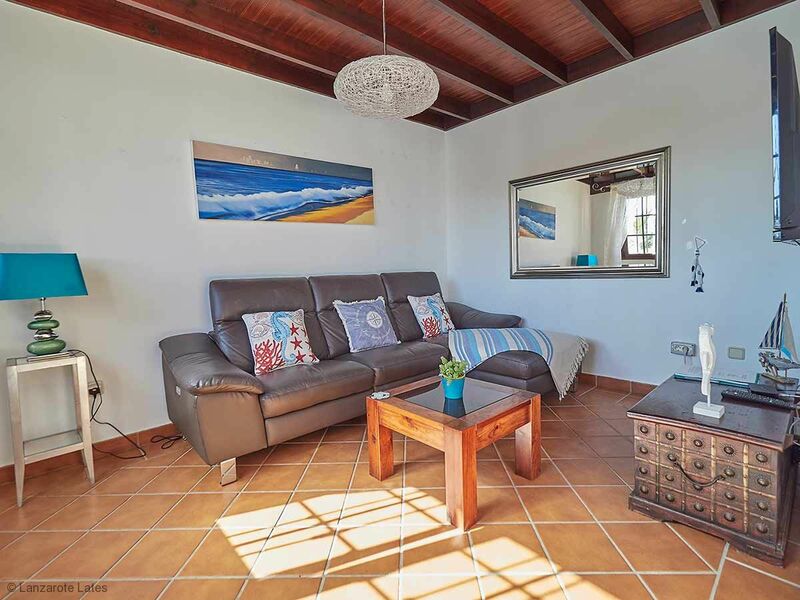 This villa is a very popular semi detached property with a good degree on privacy and a sunny south facing aspect. Maximum basking in the sun all day long, in all year round sunshine! 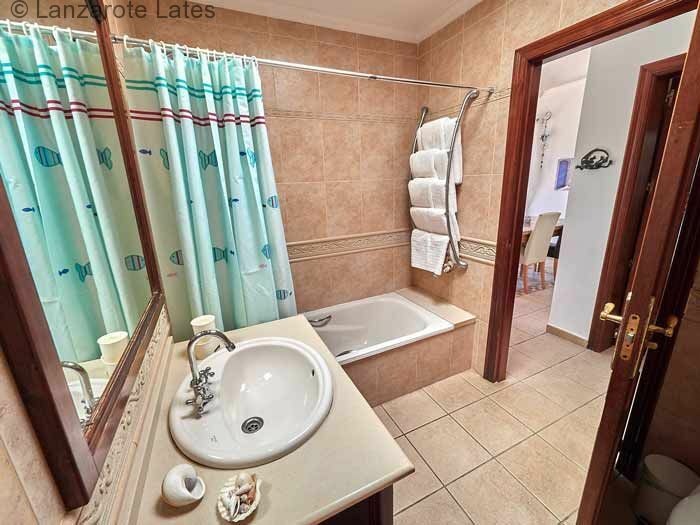 The double bedroom and a twin bedroom share a family bathroom (with shower over bath & hair dryer). 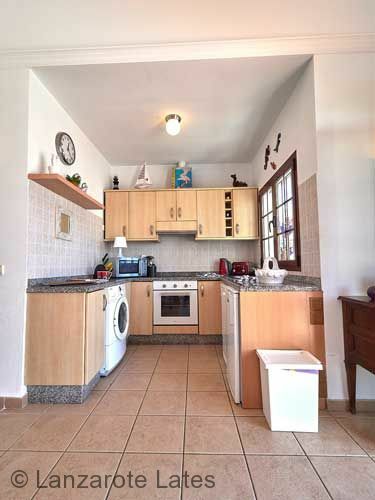 The kitchen has a washing machine, iron/ironing board, fridge, microwave, cooker, toaster, kettle and coffee machine. The separate dining room has a marble topped table and there is a second dining table with sun umbrella on the patio, next to the brick built BBQ. The cool lounge with corner sofa, TV with IPTV (more than 150 international channels and video on demand)/ DVD player/ films and free decent WiFi overlooks the heated swimming pool with sunloungers . Pool area, outside table and sunbathing area are very private. Recently, a large security is installed. Your (rental) car is safe on the private locked drive and you have a cery good degree on privacy. 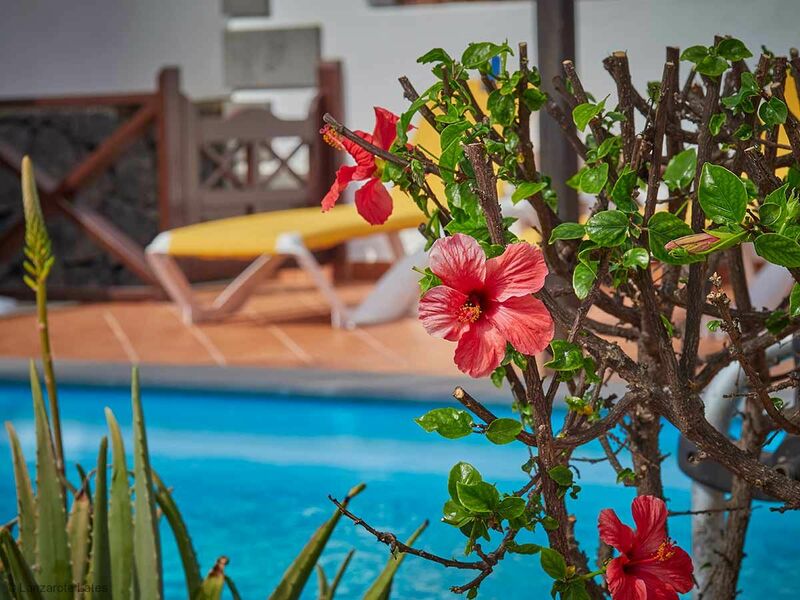 The beaches are only 5 minutes drive, or 20 minutes walk into the beautiful village of Playa Blanca. Catch a taxi to the superb Marina Rubicon, with a range of bars, restaurants and shops. There is a small supermarket a 10 minute walk away. There are excellent supermarkets in the village selling fresh fish, meat, fruit and the usual array of products. Parque Del Rey, which translates to Park of the King. After the only central entrance, you can veer to the left or right which will lead you to one of the two exits of Parque Del Rey. Within the community of 70 villas, you will find a mix of holiday and locals homes. 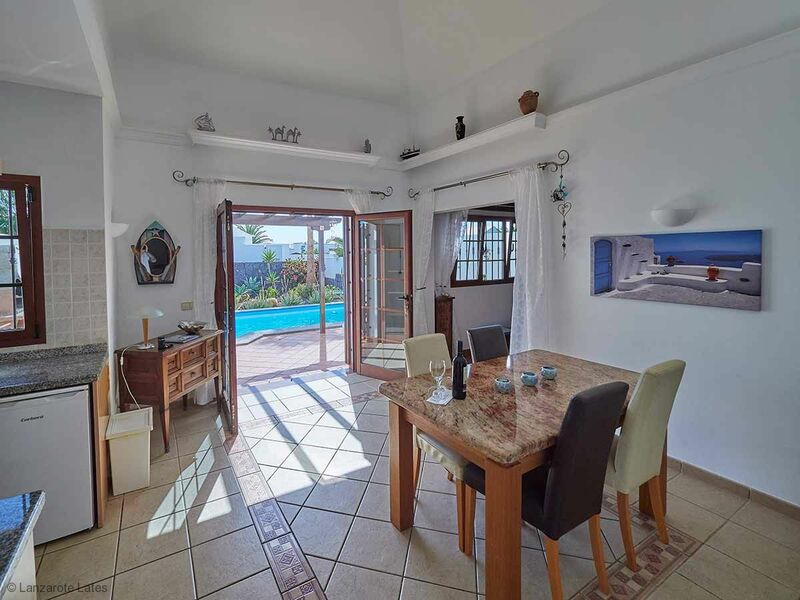 They all have pretty gardens, and gated driveways, some with sea views, and all have stunning views of Montana Roja and the Rubicon Range of Mountains. 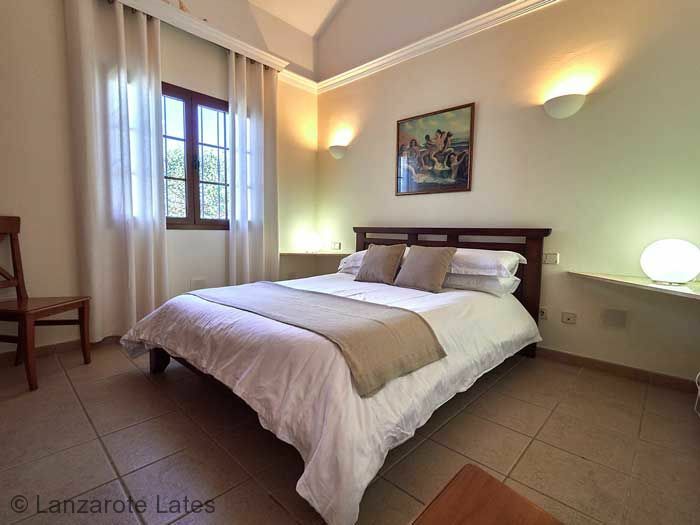 This tranquil totally flat landscape setting is certainly one to be enjoyed for couples and families alike. Although some of the villas have 2 easily negotiated garden steps. If you exit left, you can walk in 8 minutes or so to the mini market Supermerloby, there you can buy holiday essentials, including fresh bread, fruit, vegetables and local vino. You will pass the bus stop at the end of the road, which is a reliable, regular service otherwise, a taxi from Parque Del Rey to Hiperdino the large supermarket in the Village will cost a few euros. You can buy all you need here, including fresh fish, meat and in store baked bread. Head back to your villa in Parque Del Rey, light your BBQ, have a swim while the charcoal is heating up. Stretch out on your sunbed and relax in the privacy of your walled garden. If you take a right out of Parque Del Rey, and walk towards the sea, you will see some tennis courts with a well trodden path, alongside. Take this and in no time at all you will be at the harbour. A traditional pretty harbour, with the small fishing boats and by contrast the grand ferry boats too. ?Stride out to the left to discover the pedestrianised shopping street of Playa Blanca, admire the sea views in-between the shops, restaurants and bars, whether it is Tapas or Tipple you are after, you will find it here! 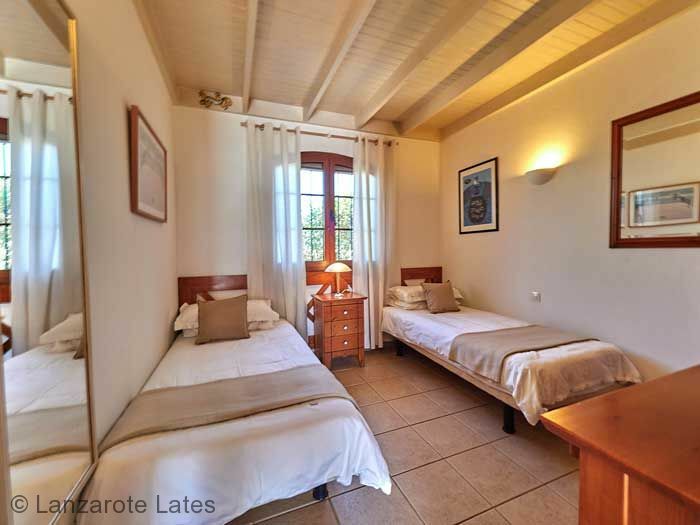 Lovely well cared for villa. Would definately return. Well equipped and the comprehensive english TV a real bonus. We have had an amazing stay. Villa is so well equipped with everything. Excellent villa. Well maintained clean and tidy. Seventh visit to Playa Blanca and using Lanzarote Lates. All villas maintained to a high standards.